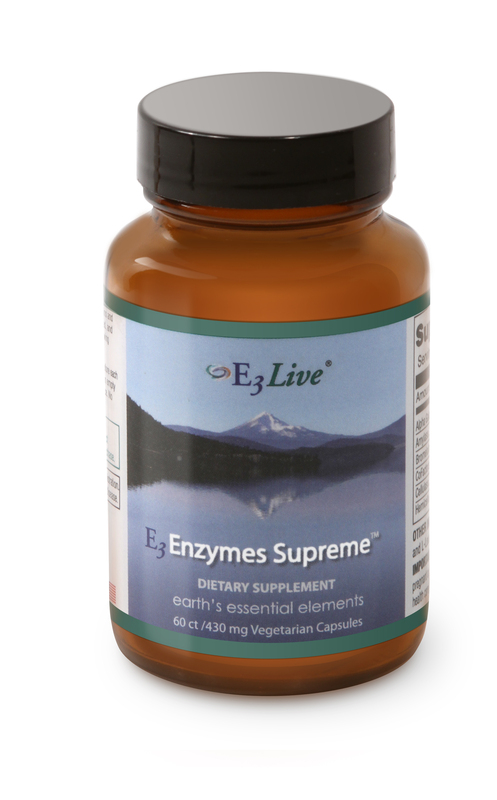 E3 Enzymes Supreme™ is our digestive and cleansing blend of plant-based enzymes and other plant-derived digestive aids. This formula consists of premium, full-spectrum, digestive enzymes with added nutritional co-factors optimized to work in wide pH variations throughout the entire digestive tract. Enzymes are the 'spark of life'. Without enzymes, our bodies do not properly break down food; therefore we do not absorb vitamins, minerals and amino acids which are the basis of health. Our immune system, bloodstream, liver, kidneys, spleen and pancreas especially depend upon enzymes for proper digestive function. Without proper enzymes, our white blood cells try to perform the purpose of the enzymes, usually leaving one feeling tired after eating, and compromising the immune system. Enzymes are responsible for every biochemical reaction that occurs in living matter. All life depends on enzymes. E3 Enzymes Supreme™ formula contains: Alpha and beta amylases, protease I & II, lipase, cellulase, lactase, maltase & invertase, glucanase, xylanase, pertinase, phytase, proprietary pepsidase. Co-factors include: Sprout and grass juice extracts, plant-derived minerals, papain extract, bromelain, rutin and amla berry (Indian gooseberry). All ingredients are from non-dairy vegetarian sources. In powder form add up to ½ teaspoon to water or sprinkle on food. Tastes good! We recommend that every person eat enzymes with their meals. And for those with digestive disorders and constipation. well you're in for a treat! These enzymes work! Also a great aid for detoxification diets. Other ingredients include cellulose and L-Leucine. Available in powder (one bottle contains 50 grams) and vegetarian capsules (one bottle contains 90 (430 mcg) capsules. Suggested Use: Sprinkle on food or mix with water. For digestion, use 1/4 tsp. or more 15 minutes before each meal. When used for body cleansing, use 1 tsp. 3 times per day on an empty stomach either 1 hour before or 2 hours after a meal. Store in a cool dry place, no refrigeration necessary. Important: Drink plenty of pure water throughout the day. If you have ulcers, are pregnant or nursing, consult your healthcare practitioner prior to use. Do not use if safety seal is broken. Suggested Use: For digestion, take 2 capsules or more 15 minutes before each meal. When used for body cleansing, take 3 capsules, 3 times per day on an empty stomach either 1 hour before or 2 hours after a meal. Store in a cool dry place, no refrigeration necessary. E3Enzymes are plant-derived endogenous enzymes found in foods that digest themselves. Enzymes are proteins acting as an organic catalyst in a specific biochemical reaction without the need for an external energy source. Lipase food enzymes digest fats, amylase food enzymes digest carbohydrates, and protease digest proteins in the diet. E3Enzymes contain proteolytic enzymes such as amylese, protease, lactase, lipase, and celulase. Why should I use enzymes? Cooked food is devoid of digestive enzymes and therefore stimulates our body’s internal enzyme secretion. This put a tremendous strain on other digestive organs, enlarges the liver and the pancreas, and sets the stage for degenerative diseases that work quietly over many years. Uncooked food is rich in digestive enzymes and only stimulates a small amount of your body’s enzyme secretion. Since less stomach acid is secreted, raw food remains longer and digests better in the upper stomach. Rather than giving up cooked foods however, we strongly recommend taking a plant-based enzyme before each meal. Some of the plant-based enzymes that are not used up while assisting digestion are able to pass through t he intestinal mucosa and enter the blood stream. Once there, they can help by chemically digesting circulating proteins that the immune system considers to be invaders. This takes an enormous strain of the immune system, allowing it to deal with the other invaders that do pose a threat. Is there a difference between powder and capsules? The enzymes in our capsules are the same as our powder form. Some find taking capsules more convenient than mixing in water or sprinkling the powder on their food. We recommend the powder for faster action. Our vegetable capsules take about 20 minutes to decompose before the enzymes are released. What enzymes are in E3 Enzymes Supreme and what can they help with?